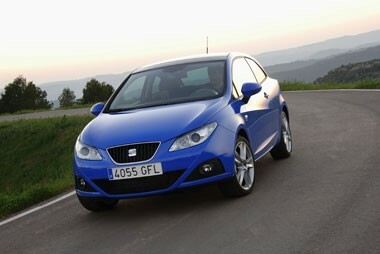 It might be second behind the Leon in terms of UK sales, but across Europe the Ibiza is SEAT’s golden boy. The new five-door model, announced just weeks ago, has already generated more than 40,000 orders on the Continent. Here in the UK, we love a three-door hatch, and if sales predictions are correct then the new SportCoupé will be the one we Brits go for. SEAT hasn’t just welded up the rear side apertures of the new five-door Ibiza – there’s been a fairly substantial redesign for the SportCoupé. You have to look carefully to see it, but once you do it’s quite obvious. The window lines towards the back are completely different, the rear lights have been revised and the shape of the body has been beefed up slightly by way of some shoulder lines. 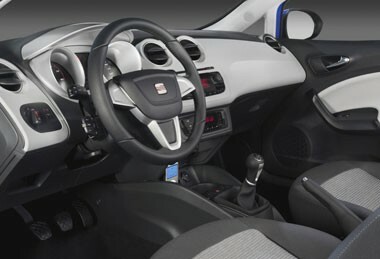 Inside, there’s an all-new interior with an upped level of build quality and materials, as well as a lower driving position designed to be more sporty. Soft-touch materials abound and, although the centre console isn’t very rigid, it’s much better put together than the existing model. Although some diesel engines are available at launch in Europe, none will be immediately available in the UK. A new range of diesel units from the Volkswagen Audi Group is due around the New Year, and SEAT is waiting for these improved, more efficient engines. So, we in the UK will get a choice of three petrol engines from launch – a frugal 1.2 with 69bhp, a 1.4-litre with 84bhp or a 1.6-litre with 104bhp. More, including the diesels, are due in 2009, possibly including an Ecomotive version with CO2 emissions of 99g/km. The petrol units come with a five-speed manual gearbox although a twin-clutch, seven-speed DSG ’box is in the works for the 1.6. The familiar lower SEAT trim levels – Reference, Stylance – will become S and SE, although the top-of-the-range Sport model will remain.. The S gets 15-inch steel wheels and a socket for MP3 players, while the SE adds climate control, cruise control, 15-inch alloys and a trip computer. The Sport model features 16-inch alloys and sports seats. Various option packages are on offer, including a storage option and a technical package with parking sensors and automatic wipers. Some 17-inch alloys are also available, as is iPod compatibility. There is a choice of suspension – comfort or sport – either of which can be specified at no extra cost, except on the Sport trim, in which sport suspension will be standard. Although ESP is standard in the SportCoupe's native Spain, it won't be in the UK, which is a shame. Instead, it will be part of a £280 option pack which also includes hill hold control, electronic brake assist and tyre pressure monitoring. Continuing the safety theme, the car scored five stars in the EuroNCAP crash test. Peter Wyhinny, director at SEAT UK, said he expected most fleet interest in the Ibiza and the SportCoupé to come next year, with the introduction of the diesel engines and the sport FR TDI version. In the meantime, the 1.2 and 1.4-litre engines could prove popular. Although the SportCoupé is likely to be more popular than the five-door overall, fleet buyers are more likely to favour the five-door for practicality reasons. With that in mind, SEAT expects the fleet/retail split for the SportsCoupé to be 35/65, compared to 50/50 for the five-door. 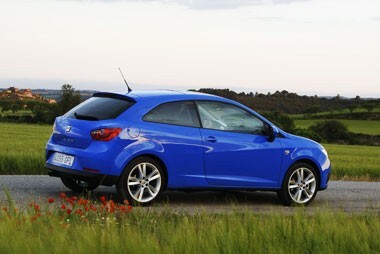 The first hour of my time with the Ibiza SportCoupé was spent on the motorway, and it was distinctly underwhelming. The top-of-the-range 1.6 engine feels pretty gutless and needs thrashing to make any kind of decent progress. And with only a five-speed gearbox, motorway cruising speed is around 3,000rpm and distinctly noisy. The ride was comfortable, but the steering felt rather numb, and after enjoying the sharp handling of the outgoing generation of Ibiza, I was all ready to slate this new version. But then I got off the motorway and onto some twisty bits, and it soon became apparent that the chassis is excellent. It whips around corners very smartly but, with the comfort suspension and the woolly steering, feels like a trained athlete in a water-filled wetsuit. Later I tried a version with the sport suspension, which feels much better but still suffers from numb steering, almost like driving a racing car with rubber gloves on. There’s quality there, but it’s a bit too difficult to feel. That said, the driving environment is infinitely better than the outgoing Ibiza, with a feeling of quality pervading the dash, driving position and very comfy seats. At the heart of the Ibiza is a very good car trying to get out, but at the moment it’s too woozy and vague. However, I have high hopes that the arrival of the FR and Cupra versions will bring the best out of what feels an excellent chassis. Then characteristics should make themselves known.